Mastiffs are one of the heaviest breeds with males often exceeding 200 pounds. This is a massive breed of dog that is quite powerful and muscular. Their heads are square with a short muzzle. No matter what color of coat, they have a black mask around the muzzle and around their small, dark eyes. Their ears are also short and dark. This dog breed used to be sought after for their fighting and guarding abilities. Over the years they have become quite gentle and patient. They are get along well in a family setting since they are quite calm and watchful. Their old guard dog tendencies do come out when guests or strangers come to visit. They will wait for their owner to let them know that the new guest is acceptable in the home before letting their guard down. Because of this somewhat protective tendency, and their huge size, proper training and early socialization are important. Like many large, Working Dog Breeds, they can suffer from ailments like hip dysplasia, elbow dysplasia, gastric torsion (bloat), and other health issues. 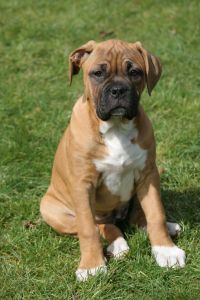 Mastiffs are among the most popular dog breeds.